European gas markets have become extremely bearish, with weather forecasts converging on consistently mild weather over the next two weeks. Last week’s surprise came from Cif ARA detaching itself from its oil anchor on a very weak looking set of coal balances. While oil held its value last week, the weak bids for coal coming from increased coal-to-gas fuel switching meant that coal broke free of oil and started to price down to compete for market share. As such, Cif ARA was down by 8% w/w to close Friday at 72.8 $/t, dragging gas down too, with the TTF still closing at the fuel switch trigger for a gas-fired plant that is 5% more efficient than a coal unit. Coal’s detachment from oil takes away much of the support that the coal market might have had, although a forecast gradual increase in oil prices over the summer could still limit how far coal can fall. Still, with coal on course to see sharp reductions in underlying demand from the power sector this summer, further weakness in Cif ARA to around 60 $/t cannot be ruled out. The other lever in that fuel switch trigger is carbon. With the coal-to-gas fuel switch picking up pace, the market draw on the carbon inventory is going to moderate, which could start to shake the conviction of the ‘buy and holds’ that entered the market last year. 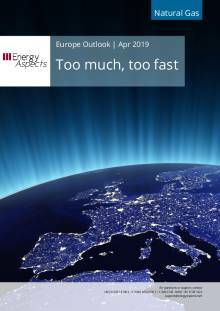 If that happens soon, the EUA market could well drop out of its current trading range, which could pave the way for summer 2019-delivery TTF prices to head to 15 €/MWh or even less. The EUA market looks set to test a significant technical support level at 21.34 €/t this week. If it drops below that, then a bigger sell-off could well be triggered. With just seven weeks of the gas winter left, the window of opportunity for an extreme weather event to pull the market out of its tail spin is getting smaller and smaller. Given last year’s extreme cold weather base, even a fairly normal set of HDDs last week saw the total European storage surplus grow by 2.3 bcm y/y, widening it to 6.7 bcm. With milder-than-normal weather forecast for the next two weeks, that overhang should expand to about 9.5 bcm by 22 February, putting it well on target to come in at the high end of our 15–20 bcm forecast range by end-March. The market will stay sensitive to the weather runs over the coming week, but continued confidence that the weather will be milder than normal could even see prices crashing below the 5% fuel switch trigger, heading to efficiency parity, where all potential hard coal fuel switch should be realised. If some colder weather starts to be forecast, prices on the TTF curve could rise, but it is hard to see much of a rally beyond the 5% fuel switch trigger for summer 2019. 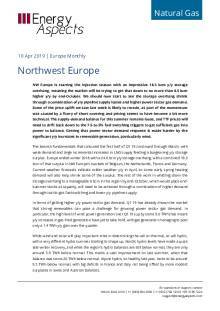 Next week's edition of European Panorama will be published on Tuesday 23 April, owing to the UK b.. Please note that users licensed for the data service can access our Norwegian data for production.. 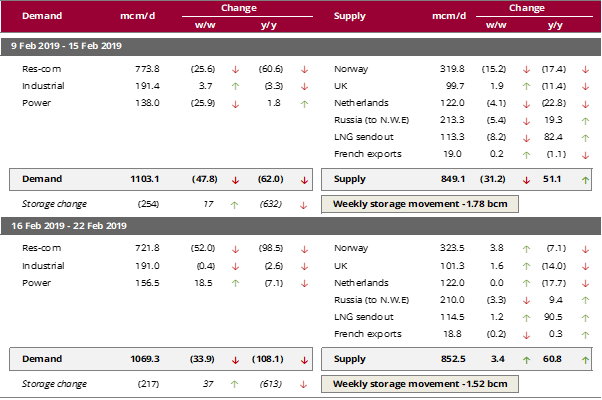 The narrative around European gas markets has seen the bearish summer story replaced with somethi..
NW Europe is starting the injection season with an impressive 18.3 bcm y/y storage overhang, mean.. The second half of last week saw a somewhat unexpected rise in prices at the main European gas hu..